Hosai Baido (1848 - 1920) The Evil Nikki Danjo in the play Meiboku Sendai Hagi, 1901. Oban Triptych. One of the great kabuki plays and this print is a pleasingly dramatic representation of the drama. The plot involves tales of palace intrigue and begins when the child Tsuruchiyo has become head of the clan. He is kept in the women’s quarters and looked after by a nurse maid (Masaoka) for fear of assassination. The palace chatelaine and her brother Nikki Danjo plot to kill the young prince. In a moving scene Masaoka’s young son is killed in error but such is her devotion that she shows no emotion and continues the fiction that it is in fact Tsuruchiyo who lies dead. As a result she is handed a scroll with the names of the conspirators. Her true loyalty is finally discovered and a fight ensues which sees a gigantic rat appear on stage and run off with the scroll in its teeth. The final scene is a classic of kabuki drama. A servant spots the rat and attacks it; it escapes but dramatically re-emerges through a trapdoor in the hanamichi (the stage extension into the theatre audience) in the true form of Nikki Danjo and carrying the scroll in his mouth. He exits the stage as if walking magically on clouds. This is a very popular subject in ukiyo-e. There are many prints of Nikki Danjo, dressed in grey, floating on a cloud emanating from a giant rat. 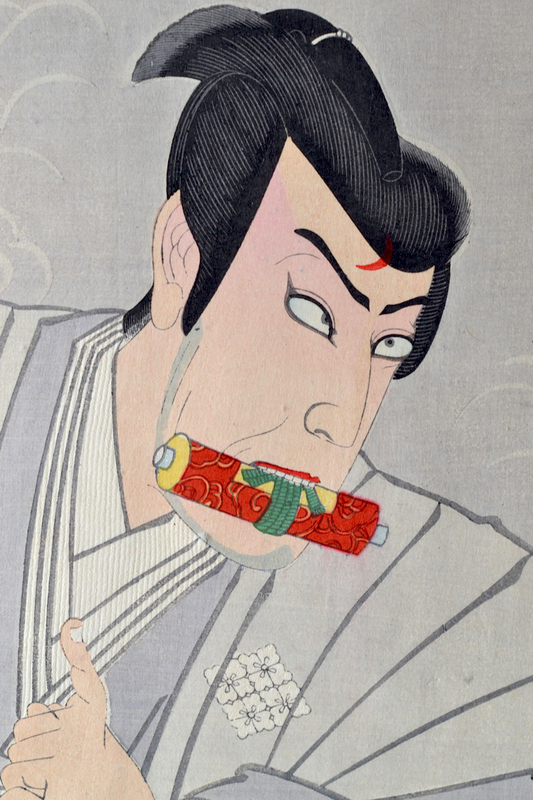 In this print we can clearly see the scroll in the teeth of Danjo in the left hand sheet. Danjo is played by the great Ichikawa Danjuro IX. Ichimura Kakitsu plays the good guy in the right hand panel. Ghostly and magical smoke emanates from the magician’s robes. Baido, sometimes called Toyokuni IV, is a very fine artist and greatly underrated. This print is a great design and is bold and uncompromising in its composition and striking colour. A fine print, full size - the colour, impression and condition are all fine. Published by Fukuda Hatsujiro, Signed (confusingly) Utagawa Hosai hitsu.